Here’s our FPL double gameweeks and blanks article in preparation for the FA Cup 5th round. We’ll use this article as a base to amend the blank schedules for GW31 and GW33 as the weekend progresses. 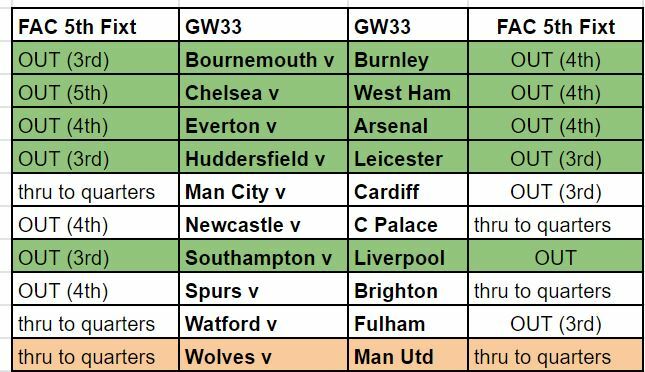 Here’s the final update of the GW31 and GW33 schedules after the Man Utd win over Chelsea. I will do a separate article next. The FA Cup quarter finals and semi finals will be played on the weekends of the premier league gameweeks of GW31 and GW33. They will therefore require postponements outside of the current gameweeks. With UEFA rules requiring no clashes with European fixtures the only options as GW32 and GW35. The 5th round results this weekend will determine who has quarter finals clashing with the premier league GW31 fixtures and will therefore require postponements. These will be updated within this article after each days games involving a premier league team. 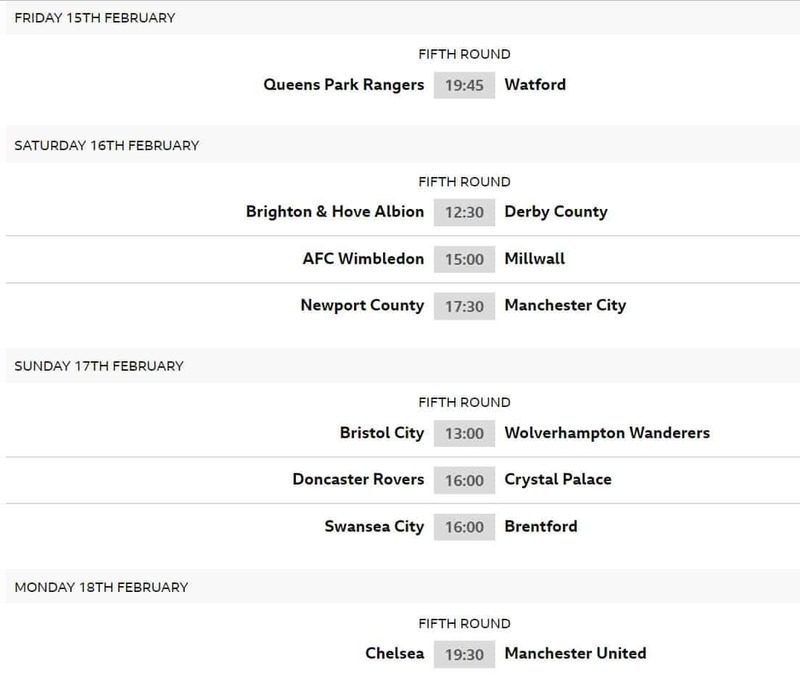 The fixtures in green will not be postponed as each team has been knocked out of the FA Cup. Orange are the ones that will be postponed. The fixtures in green will not be postponed as each team has been knocked out of the FA Cup. Games involving the semi finalists will be the only ones postponed and hence we will not know these until after the quarter finals. That’s except for Wolves v Man Utd which is a quarter final match so one must progress. Now 8 teams have games guaranteed in GW31 and GW33. They are Chelsea, Everton, West Ham, Liverpool, Bournemouth, Burnley, Huddersfield and Leicester. These options assume you have a wildcard and a free hit and one of a TC or BB. I’ll add to these through the weekend in italics. One thing which is high in my mind is whether the GW31 postponements go to GW32 and the GW33 postponements go to GW35. It’s possible that there will be no announcements until after GW31 as the TV companies mix and match postponements to maximise TV viewing figures. Interestingly they’ve made no announcement of the Chelsea v Brighton EFL final postponed fixture. Option 1 means you prepare for GW31 through transfers and then maximise double GW32 through the wildcard. You free hit GW33 while having 2 transfers to prepare for GW35. Depending on the state of your team now you may find it difficult to field 11 players in GW31. It has the advantage of full visibility for the postponements before you use a chip but a free hit in GW33 seems a bit of a waste if you’ve prepared for GW31. I hear the argument alot about having to bring in players from poorer teams to fill GW31. I think that has been over played. In GW31 you would have 3 Liverpool players, 4 on the bench of the likes of Pogba, Rashford, Aubameyang etc leaving 4 players from the other teams only in the lead up to GW31. 2 of which could have been transferred in on GW31 itself. That doesn’t seem too bad to me. The first is hope Chelsea get through to the FA Cup semis and therefore need an additional postponement as they still have their EFL final fixture to be played. Secondly, play it in GW36 and hope Salah starts v Huddersfield. Thirdly hope the weather creates postponements which looks less likely as we get through winter. Option 2 means you prepare for GW31 through transfers and then maximise double GW32 through the free hit. If you have representation of the 5 teams that have fixtures in both GW31 and GW33 you should be able to transition easily between the 2. However, depending on the state of your team now you may find it difficult to field 11 players in GW31. As I said above, I hear the argument alot about having to bring in players from poorer teams to fill GW31. I think that has been over played. In GW31 you would have 3 Liverpool players, 4 on the bench of the likes of Pogba, Rashford, Aubameyang etc leaving 4 players from the other teams in the lead up to GW31. 2 of which could have been transferred in on GW31 itself. That doesn’t seem too bad to me. 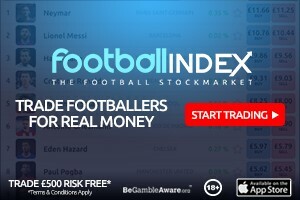 This option allows you to play as normal up to the GW30 and prepare for the the double 32 and 35 through a wildcard in GW30. You sort blank 31 out through a free hit and hope you can transition into GW33 with minimal damage. It has the advantage of not having to prepare in advance but the disadvantage of the GW32 and GW33 transition. It also doesn’t allow you to have visibility of the dates of the postponements if they aren’t announced until after GW31. With option 4 you prepare for double gameweek 32 through transfers leading up to GW32 and free hit your way out of avoiding the blanks. You then hope you can transition into GW33 with minimal issues and you obviously maximise GW35. This again means you can avoid the likes of Burnley in the lead up to GW31 but it also assumes you know which postponements go into GW32 and that you can transition into GW33 from that with minimal pain. This is another option I’ve seen floating around and is the reverse of the Yaniv option where you wildcard for GW31 and GW33 and then free hit in GW32. This is a good option in that you know exactly what you’re dealing with when you use your wildcard and your free hit for the double. The difficulty is the transition afterwards. You have to transition between GW32 GW33 and GW35 without any chips and that could be tricky. As I write this I’m not committing myself to an option. The 5th round results will determine this. All things being equal I would like to do option 2 but when I put Son in as opposed Mane and Morgan lost his place I’m now in a position where my maximum team for GW31 is 8 unless things go my way in the 5th round results. I may change my view if the postponements for GW31 are announced before the GW27 deadline but if that doesn’t happen I’m in for some hard decisions. So I’ll update this at the end of each day, hopefully, over the weekend and then I’ll do a refresher article with my thoughts. I hope to do a simulation with my team using the different strategies to see how they work. I’m also hoping to put together a contributors FPL double gameweeks and blanks special for next Wednesday and Thursday where the contributors say how they are going to deal with the doubles and blanks. Some have used their wildcard so you’ll get that perspective. I’m also running a separate team where I’ve deliberately used the free hit chip so to do a separate article on how to navigate the doubles and blanks without the free hit. I’ll introduce that next week as well. I’m also hoping to get hold of one where you have no chips to see how that could work. So plenty more to come. Hi Dylan sorry if that was confusing and I’ve amended the wording slightly. I love this stuff. I made a spreadsheet too out of excitement/boredom which plays out the win ir lose scenarios from this weekend’s FA matches, then spits out how many teams fit each of the fh 31 and fh32 strategies for you. I can post the public docs link if you want but this isnt my site so I wouldnt do that without geek’s permission. I put it on fplreddit yesterday if anyone does want to use it. The stuff geek already shared is awesome too, not trying to steal any thunder. Just use it if you want or not, I dont care lol. I honestly love all the dialogue you post geek and the comments from the other pros and the regular comment posters are great too. I dont even go to any other sites anymore besides the price prediction ones, reddit and there is one pod I really like. Just this one for articles. It is the best by a mile. Thanks for the nice words. They’re greatly appreciated. Are Wolves really 9-1 to win the FA Cup. Seems generous..
Option 6. FH31, BB32, WC34, TC35. This may work well if you will have a few Liv, Sou and Ars (assume Wol win). Problem with that approach Dean is that you wont utilize the BB to full effect. I would BB with 13 double game week players plus two Liv in 32. Then play for 33: 2 liv 2 Ars 2 sou plus loosing QF, plus one transfer in. QF draw is important. Well if you can get a good 13 doubles out GW32 then that would work. But once again, it is a guessing game as to what the FA will do for GW32. I personally don’t like the option tho. I undrstand your point there are issues with all the options. However planning for option 6 doesn’t disrupt my team much and if the fixtures don’t pan out as expected I can always WC in 30 (option3) or 32 (option7: FH31, WC32, BB35, TC36). With only 3 from Liv guarantee to play in GW31 and the rest is blank, I must choose FH31 route. The remaining chip plan will be based on the fixtures of FA Cup Round 6. Hi Geek, isn’t Wolves v Man U. now definitely gone from GW 33? This is correct. It’s going to require some thought. Not easy with money in Doherty, Jimenez, Pogba and Rashford. I currently have six GW31 players so need to buy 5/6 in over the next five weeks to build a GW31 team. I do think option 2 provides a smoother transition with GW31 players also playing in blank GW33 and then free hitting in GW32 for a team of “doubles”.. The only down side is diluting the quality of the team slightly while building the team, plus having to sell one or two players who ideally you would want back again when wildcarding in GW34, with the buy back price being above the sale price. Best to keep some money in the bank to cover this ?? I think it’s possible to navigate 31 without fielding 11. Helder… taking a -16 to get to GW31 is madness in my opinion. 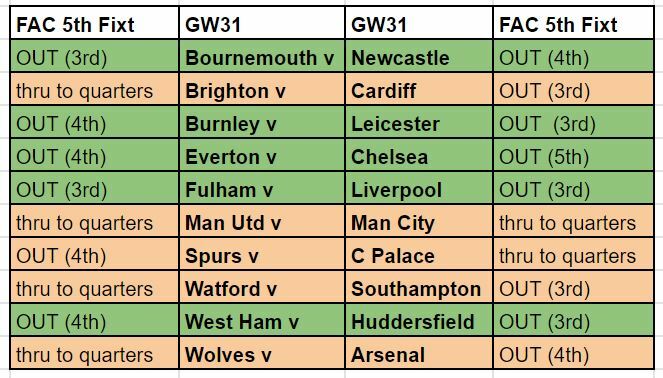 In blank GW33 there will be at a minimum 6 fixtures going ahead as one of either Watford v Fulham or Newc V Palace will go ahead depending on the result of Watford v Palace in the FA Cup. If Brighton lose to Millwall then Spurs will have a fixture and that would make GW33 very manageable without a chip I feel. Even without the Spurs fixture it would be ok. The Geek’s no free hit team strategy helped me win my mini league and finish top 25k last year, for which I am eternally grateful and an unconditional fan. I’m going option 2 – the hard work, such as it is (I’ll be fielding 9 or 10 if I take a hit) is done before GW31, and it seems relatively straightforward from there on in.